Available in a wide variety of crisp and vivid colors, our Crinkle Cut Eco-Spring Fill takes up more space so you can use less in your gift baskets and boxes. Made in the USA. Recyclable. Contains 100% recycled paper. Crinkle Cut is a Trademark of Spring-Fill Industries, Inc. Accordion shaped shred, which expands, is perfect for heavier weight gift basket products. A 10 lb. box of Fill measures 24 x 16 x 11". 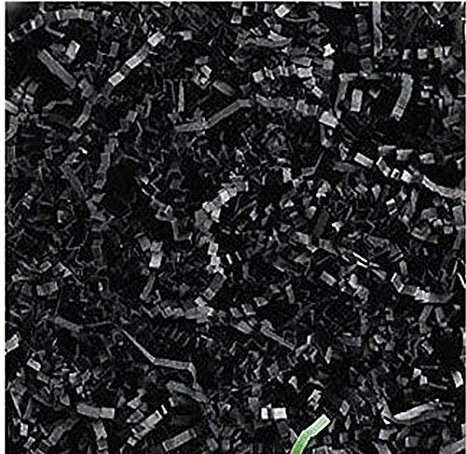 Natural black Kraft Crinkle Cut Eco-Spring paper fill takes up more space in your box or gift bag so you use less. Accordion shaped paper shreds expand and is perfect for heavier weight gift basket products. 10 lb. box of box filler measures 24 x 16 x 11. View More In Gift Wrap Crinkle & Filler Paper. If you have any questions about this product by Deluxe Well-Designed, contact us by completing and submitting the form below. If you are looking for a specif part number, please include it with your message.